Another stunning story as recorded by Dr. Luke about Jesus meeting a need, right where He was walking by. In this story of faith, we have a blind man making his way into a crowd looking to see Jesus, and himself, hoping top be healed by Jesus that he might see. On the other side, we have the disciples of Jesus, who appear at least in this instance to have lost sight of the very purpose of their calling, and training with Jesus, that being to meet the needs of the people. While the disciples don’t get it, a blind beggar and a socially outcast tax collector do. They both respond in faith to Jesus. In those days, the most likely response by a roadside begger would be to ask for alms. 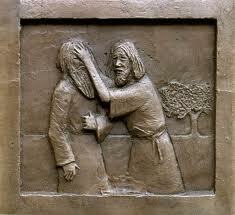 Up to this point in Bartimaeus life his blindness was a way of securing a living from alms of a passerby. But this man , seeking afte Jesus refuses to scale back his request; he asks Jesus for the ultimate. 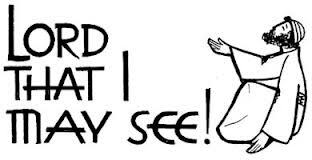 “Lord, let me see again!” Jesus’ response? “Recieve your sight!” And then commenting on the persistent and intense plea for mercy, say’s your faith has saved you”. This man was at a point where he had lived with this blindness for all his life, he had heard that Jesus was coming and was determined despite the circumstance of his sight that if he just made his plea of mercy that maybe Jesus would hear and respond. What did he cry out for? He didn’t ask for anything but mercy. Mercy, ‘not getting what you deserve’. How often do we ask God for mercy in our prayers as He walks by us throughout the day? It seems that at least in this instance, that the Lord heard this man’s plea, asking Him for what he couldn’t do for himself, He hears the plea, and sees the condition, and answers the request. Amazing, that the disciples of Jesus who were actively involved in the ministry of Jesus, were so caught up in the action of the ministry that they themselves had lost sight of what they were being trained up for, to bring people to Jesus. How dangerous it is when we who are called into the ministry of Jesus Christ, forget the reason why we were chosen to this special calling. To bring people to Jesus. And yet it is so easy to, like the apostles here, to lose sight of what we were called for to be overwhelmed by whatever the burden of the world is at that time. I love this, above the commotion and noise in the crowd, Jesus hears this man’s plea, and Luke records that Jesus stood still. Remember what has caused Jesus to stand still. What was it? A plea to Him for mercy. The phrase stand still is defined as a condition in which all movement or activity has stopped. This is exactly what we are to do when in our busyness of the day, God sends us a Bartimaeus, a certain somebody that has a need, and has come in faith seeking help that he might see God. We can do this by, stopping all we are doing, putting down the phone, laying down that pen, whatever is holding our hands away from making them useful and direct for the person in need. Exactly what our response should be. What is it you need that I can help you, by leading you into the presence of the Lord. The Bible teaches us that we can ‘enter in boldly before the throne of God to receive mercy and help in a time of need. It’s kind of sad that Jesus had to command the apostles to bring the man to Him. Nevertheless, we need to be listening to the Lord, waiting to see what He wants to do here. If you had but one request to God, that could be answered, immediately what would it be? For some it might be financial. For others it might be a relationship. And for others it might be a health issue. This passage reveals that when asked by Jesus, that Bartemaeus answer was the ultimate request. He was not settling for just glasses to see, he asked that he would receive his sight. Lord, let this be our prayer in our calling. That we may be enabled to receive spiritual sight that whenever the opportunity arises, we be ready to stand still and listen, and pray for the touch of God. What a great picture Jesus has given us. A certain man who had a name, a certain need that he’d carried his whole life. An ultimate request when he couldn’t contain it any longer. Jesus asks us today to have this kind of faith. When in need, ask Him for the impossible! When God sends us a certain man or woman, be merciful, stand still, and see God fulfill the ultimate request, whether in your life or someone else. Do you have an ‘Ultimate Request’ for God, that you can’t hold in any longer. Let us know, at the top of this page under ‘Prayer Need’. We will be praying for you! Check this awesome video out! This was such an AMAZING post! I love how the Lord really uses you to take things so much deeper! Thank you for this blog and just your words of truth and encouragment! This post spoke to me directly in several ways! Very cool! God bless you brother! Hope to see you around here soon!